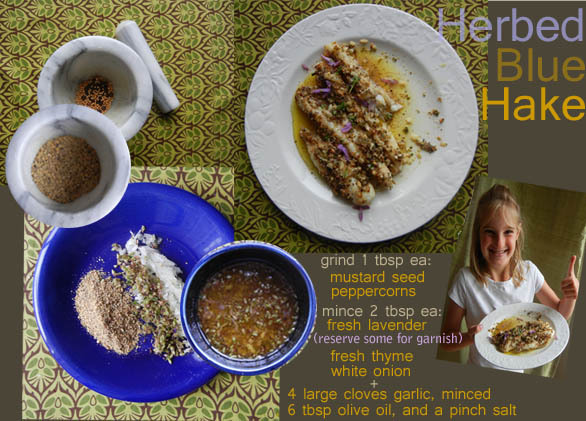 Our “recipic” for Herbed Blue Hake highlights how ground mustard seed and peppercorns are combined with lavender, thyme, onion, garlic and olive oil to produce a highly aromatic herb mixture that will entice everyone to join you in the kitchen the minute it starts baking! Create a tight fit for your fish in a foil covered pan. This will help contain the sauce over the fish while baking. Place the fish on top of the foil that has been layered with some of the herb sauce. Bake at 375 for 15 minutes, then Broil for 10. Adjust temps and times accordingly (fish portion size, oven behavior). Watch your fish carefully especially while broiling and reduce broiling time as needed.